Pennsylvania has over 85,000 miles of streams and rivers which drain its over 46,000 square miles. There are regulations, known as Chapter 105, Dam Safety and Waterway Management, that were created to protect the health, safety, welfare and property of the people; and to protect natural resources, water quality and the carrying capacity of watercourses. These regulations are primarily administered by the PA Department of Environmental Protection (PA-DEP), however, the Conservation District helps administer parts of this program by providing information and acknowledging some types of permits. 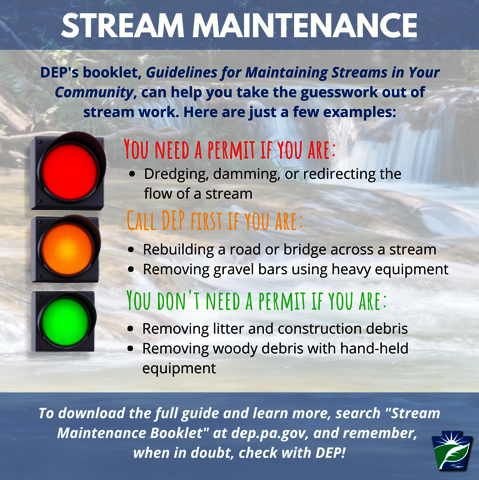 NEW-- Guidelines for "maintaining" streams, discusses in-stream or near stream activities that: 1) do not need permit (unregulated by DEP), 2) may likely need a permit or authorization, and 3) would definitely need permit, authorization or other DEP coordination (as well as other Federal and State Agencies requirements) to conduct. Also includes discussion of "myth vs reality" pertaining to DEP stream permits and authority with various stream activities. Activities and structures in or near a stream or its adjacent floodway are regulated by this program. In most cases, a permit is required before starting any activity which changes, expands or diminishes the course, current or cross-section of a stream, floodway or body of water. This means that most types of excavation in, along, or across a stream- even if the excavated material is put back after the work, will usually require some kind of Chapter 105 permit or authorization. Typical activities that are commonly permitted include: driveway culverts, highway bridges, utility line stream crossings, stream bank stabilization projects, etc. What is a regulated stream/floodway? A regulated stream is any channel with defined bed and banks that can convey water. It can be natural or man made, perennial or intermittent. Some municipalities have flood insurance studies and maps prepared by the Federal Emergency Management Agency (FEMA) which indicate the floodway boundary for some streams. In the absence of such a study, the floodway shall be considered to extend 50 feet landward from the top of each streambank. In Centre County, FEMA has delineated floodway areas along Spring Creek in Spring Township, Bellefonte Borough and Milesburg Borough; and also along Bald Eagle Creek in Boggs Township, Milesburg Borough, and some downstream municipalities. Most other areas and streams would use the "50 foot rule" mentioned above. Projects that are large in scale or impact require the submission of detailed drawings and engineering studies to show the impact of the project to the stream. These types of projects, for example, a highway bridge over a large stream, would need to be designed by a professional. Chapter 105 GENERAL PERMITS were created for activities or structures that do not pose a significant threat to flooding or the environment. A Chapter 105 General Permit (GP) has a pre-approved set of conditions, construction limits, dimensions and other criteria which apply to many common types of projects. If the work that an applicant is proposing meets all of the conditions of the GP, then the applicant need only register his/her intent to use said GP, and receive acknowledgement. The conditions of each GP are included in Part One and Part Two of the permit. Follow the PA DEP "eLibrary" page for GENERAL PERMITS link below to find these conditions. The Conservation District will do a review of your application after it is submitted to ensure that you meet the conditions of the GP being applied for. Often, the Chapter 93 stream designation may dictate whether or not a GP may be used for a project. Official designations of drainage basins and streams are listed in Chapter 93. Water Quality Standards of the Pennsylvania Code. PA-DEP's eMapPA site may be used as a guide to locate streams/watersheds designated as "High Quality" and "Exceptional Value", also known as "Special Protection waters". When a project or activity does not qualify for GP use, other Chapter 105 permits/authorizations may be applied for. Contact our office or PA-DEP Northcentral Region Office (570-327-3636) for guidance. or Discover Card. Government agencies and Municipalities are exempt from this convenience fee. If it does, we will forward a copy of your application to the U.S. Army Corps of Engineers for an individual review. If this happens, you will receive separate authorization from the Corps. In either case, you need only submit your permit application to the Conservation District, and we will notify you the review status of your Federal Authorization. If you have any questions about permits or permit coverage, call the Conservation District office or email a member of the Erosion control staff. In addition, we can mail permit forms if necessary.